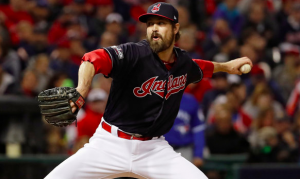 After making just two appearances since returning from the DL with a knee injury, Cleveland Indians reliever Andrew Miller may be heading right back to the injured list. Miller left Monday’s game against the Red Sox after throwing just seven pitches. The team said afterward that he aggravated the patellar tendinitis in his right knee that forced him to the DL earlier this month. He will be evaluated on Tuesday, but another DL stint appears likely. From the minute Miller stepped on the mound Monday, something about him looked off. He was nowhere close to hitting 95 mph with his fastball. One of Miller’s pitches was only clocked at 88 mph. After issuing a walk to Mookie Betts, Miller threw a first pitch ball to Andrew Benintendi before walking off the mound, prompting manager Terry Francona and the team’s trainer to visit. At that point, Miller asked to come out of the game. The Indians were able to rally late and win the game. But several Indians players expressed concern afterward at the possibility of losing Miller to injury yet again. When he’s been healthy this season, Miller has once again been one of the most dominant relievers in baseball. He has a 1.65 ERA and WHIP of 0.79. With Allen entrenched as the closer, Francona has been able to use Miller at any point in the game, making him invaluable. Now the Indians can only hope this is a minor setback and not something more serious. The silver lining is that the Indians hold a 5.5 game lead atop the AL Central. That should help the Indians avoid rushing Miller back, which likely means a trip to the DL. But that doesn’t make the setback any easier to deal with for Miller. Losing Miller has the potential to change the entire shape of Cleveland’s bullpen. As last year’s ALCS MVP, Miller was instrumental in the Indians reaching the World Series. At this point, the most important thing for the Indians is making sure Miller is healthy by the time the postseason begins. That gives them six weeks to get him the rest and treatment he needs to recover from Monday’s setback.